This section of my webpage is devoted to Final Fantasy's Chocobos. Chocobos have appeared in the "Final Fantasy" series of games. I feel Chocobos were best used in Final Fantasy VII, where you could race them at the Golden Saucer for sport, catch wild Chocobos to ride on, and even breed Chocobos at the stables! Chocobos were also seen in Final Fantasy III, and even "Final Fantasy Adventure" for Gameboy. In Final Fantasy Adventure, a Chocobo was a NPC (non playable character) which let you ride on his back when you asked him to. Later he becomes Chocobot, when he is given robotic legs since he is injured saving the main character's life. Chocobos seem to be a cross between ostriches and horses. They allow humans on their backs and travel great distances. Some Chocobos can even cross rivers, mountains, and oceans! The limitations of a Chocobo have to do with its color. Only certain color Chocobos can do certain things. It is sad to say that in Final Fantasy 8, you can kill Chocobos for fun as a mini-game (RUMOR)! 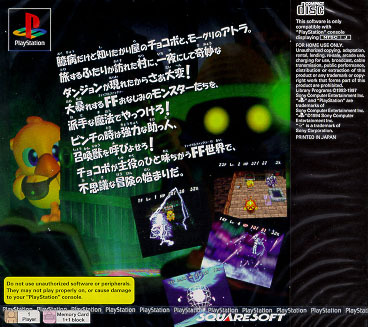 Now, since Chocobos are so popular, they are given their own game, "Chocobos Mystical Dungeon"! This game is currently only released in Japan, but is said to be coming to the USA. 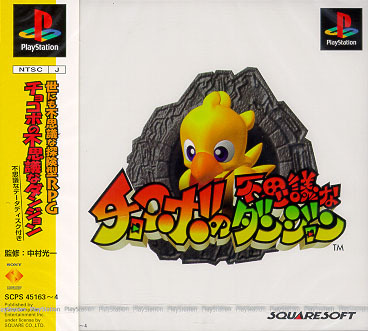 In "Chocobos Mystical Dungeon" you play a chocobo (Of Course), and the setting is a dungeon filled with all kinds of characters, enemies, magic, and puzzles. Near the dungeon is a town full of people that can help you out on your journey. The Chocobo in the game appears to be a young one, due to his small size. He can fight, summon spells, and do more cool Chocobo stuff. Chocobos Mysterious Dungeon is a typical Role Plating Game in which you must solve puzzles, meet certain other characters, work with magic and summons, as well as fight the enemy to enhance your own strength. I think it would be a great game for RPG, Final Fantasy, and Chocobo lovers alike, and I am awaiting its US release, mainly because I am a Chocobo fan, and have always wanted to play as one."WARK!"